Stocks cratered when Ukrainian officials announced Russian forces invaded their country. Actually cratered might be a too strong of a word to describe the early 9-point selloff. How about we say stocks yawned 9-points following reports of a Russian invasion. Here’s the headline bears have waited for and they are dumbfounded by the market’s lack of a reaction. How could such bearish news result in this small of a dip? Easy, everyone who feared the Russian escalation sold a couple of weeks ago during the dip to 1,900. With all those worrywarts long gone, that means anyone still holding stocks isn’t afraid of the Ukrainian crisis since they already demonstrated a willingness to own stocks through the previous dip. While the media can hype up the story all they want, if owners don’t care to sell the fear, stocks will hold firm in spite of the noise. The time to sell the Ukrainian crisis was when it first developed. Now that it’s old news, the market doesn’t care. If bears are looking for something to takedown the market, they need fresh and unexpected headlines. Volume continues to be pathetic leading up to the three-day weekend. Labor Day is the traditional transition from summer trade to the more serious fall session, ultimately leading to year-end positioning. Big money managers that spent the summer at the beach house are returning to work and the decisions they make will determine how we close the year. Will they feel compelled to chase the market and continue bidding prices up to record highs? Are they content with their portfolio and will coast into year-end? Or do they see valuations getting a little too rich and start locking-in profits? While we don’t have the answer to these questions now, at least we know what to look for in coming weeks as September trade sets the tone for the fourth quarter. 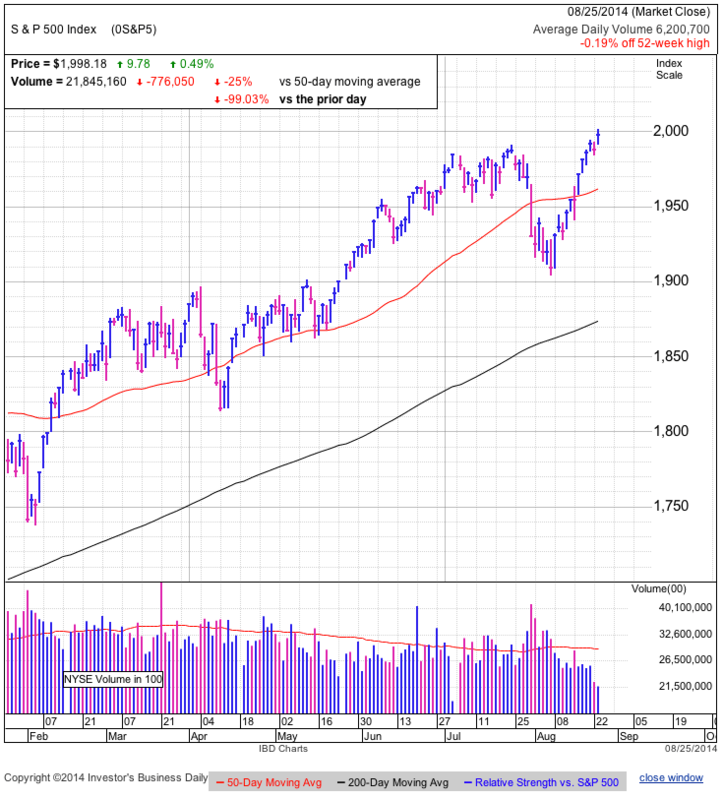 Stocks continue trading near 2k and show both a lack of breakout buying and profit taking. But pausing more often leads to a continuation than a reversal, so we should expect the next move to be higher. But if this is the start of the next leg higher, or one last short-squeeze before reversing lower has yet to be seen. By mid-September we should have a better view on what big money is thinking and how they are positioning for the rest of the year. A lot of nothing as the market barely moved intraday, ultimately finishing flat on unusually low volume. But sometimes no news is good news. This is the third day we held the 2k level. This is significant because markets typically stumble from unsustainable levels fairly quickly. Holding here for another couple days shows we haven’t stretched the rubber band too far yet. This isn’t a justification to buy record highs with reckless abandon, but simply suggests the next few points will likely be higher. And even bears can get behind a few point rally because double-tops and head-and-shoulder patterns by definition exceed the previous high before breaking lower. As for what traders are thinking, those that own are comfortable owning and those that are afraid of the risks continue staying away. When no one changes their mind, we don’t have waves of buying or selling that drive market moves and is why the we are pausing at 2k. It is noteworthy this technical milestone didn’t set off a wave of breakout buying or short covering. That shows many traders anticipated this move and took their positions ahead of time. It also indicates few owners think we’ve come too far and are taking profits by selling into the strength. The one concern I have is how many people assume our next stop is 2,100. If the average trader thinks we are headed to 2,100, that means they already bought in. But if they already bought in, that means there are fewer left to continue buying the market and pushing us higher. While the final few weeks of low-volume summer trade is interesting to watch, nothing really matters until big institutions start maneuvering their portfolios for year-end following the Labor Day holiday. The million dollar question is if big money wants to continue accumulating stock because they still see bargains, or if they are more inclined to lock-in gains because everything appears fully valued. It seems highly unlikely the market will finish the year at 2k and either we continue marching higher, or we crash through the August lows. At this point I’m fairly agnostic and will simply wait for the market to tell me which way it wants to go and seeing how we trade through the first few weeks of September will go a long way to telling us how the market wants to finish the year. Break out the party hats, the S&P cracked 2k for the first time. The market came a long way from the 666 doldrums in 2009 and with the benefit of hindsight, all the predictions of doom and gloom were grossly exaggerated. Maybe the Fed’s intervention saved us, or maybe it was the resilience of the human spirit. Either way it shows it is better to bet on the market than against it. Further, I have no doubt this secular bull is not even halfway done, but that is the long-term view, as traders we are more interested in what comes next. While the market is clearly higher than it was a couple of weeks ago when it sank to 1,905, bears desperately cling to a few glimmers of hope even as we make record highs. Today’ volume was pathetically low. The only day in recent history undercutting today’s low was July 3rd’s half-day. We were also unable to close above 2k when breakout buyers failed to flood the market following this momentous occasion. Summer’s traditionally low-volume often leads to more erratic moves since it gives a larger voice to smaller players. The real question is what will happen when big money returns after Labor day. With the VIX back in the 11’s, whatever fear sprouted from the Ukrainian and Iraqi crises has clearly vanished. While the 90-point plunge did a good job purging weak holders, it seems like we returned to nearly the same level of complacency. While complacent owners are often bullish because their reluctance to sell keeps supply tight, we have to wonder how many prospective buyers have not already bought into the invincible rally. While markets can top in a dramatic inverted V pattern, more often they end with a double-top or head-and-shoulders. Very few people see a top coming and either fail to lock-in profits when times are good, or they assume every dip is buyable. The recent rebound further reinforces the widely held view that every dip is buyable, but by the time everyone knows something, it soon stops working. While I don’t have a crystal ball, it seems the market is at a critical juncture and either we end the year dramatically higher or dramatically lower . Will buyers continue to chase prices to record highs? Or will smart money start locking-in profits in coming weeks ahead of the inevitable pullback? It won’t be long before we have our answer. 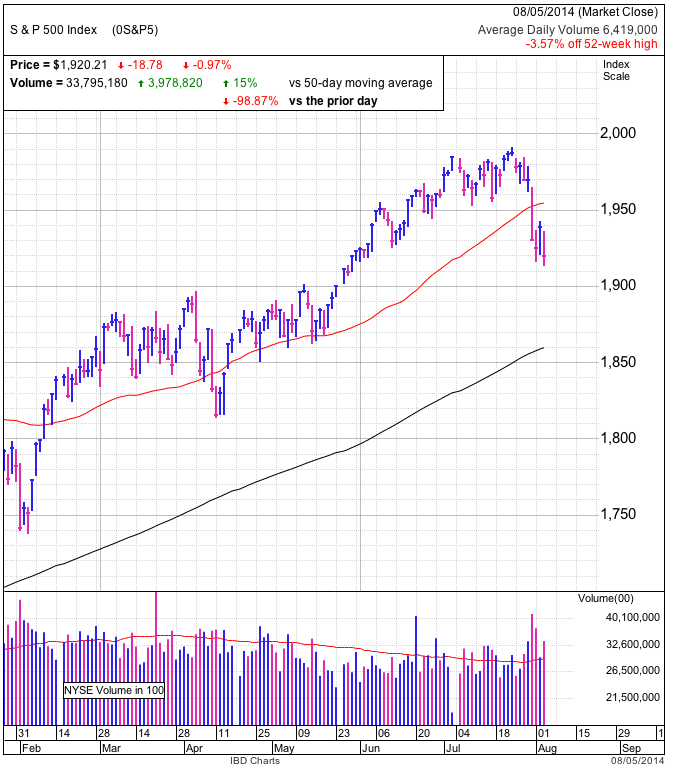 If the market continues marching higher, join the bandwagon, but another dramatic sell off in the near-term will be a big warning sign to anyone who is paying attention. Two-years ago the market was afraid of its own shadow and traders would scramble for the exits every other week. Now it seems civil wars and sanctions against some of the world’s largest oil producers hardly raises an eye. My how far sentiment has swung in a couple of years. While everyone knows the market will pullback at some point, the hard part is figuring out exactly when it will happen. Is it next week, next month, or next year? I think the next few weeks will go a long way to telling us how the year will end. 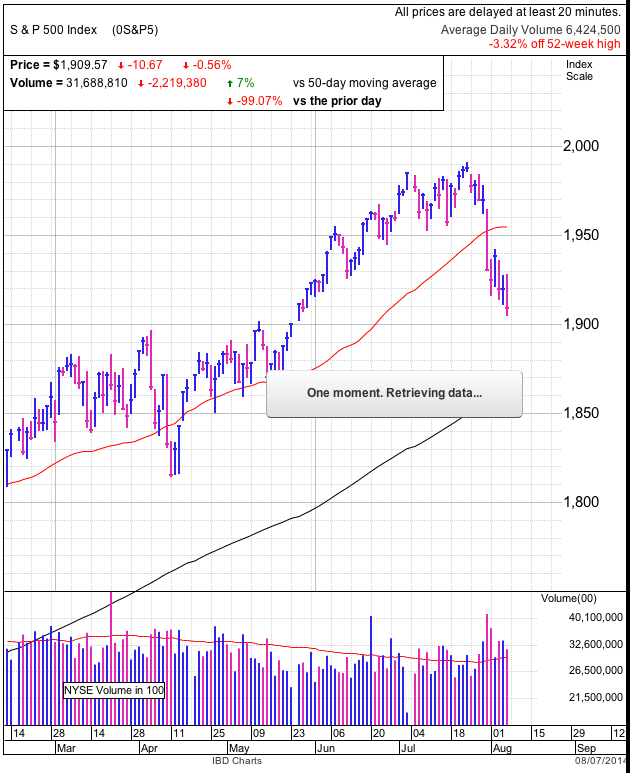 Buyers jumped back in following yesterday’s minor dip. Volume was modestly higher, but still well under average as the trend of apathetic trade, or more accurately a lack of it, continues. Owners are comfortable owning and few are selling the strength. Those that don’t believe in this bounce already sold it, with the more bold going short. And most with cash are reluctant to bid up prices in anticipation of future gains. Those factors conspired to leave us slightly above the recent 1,910/1,940 consolidation. 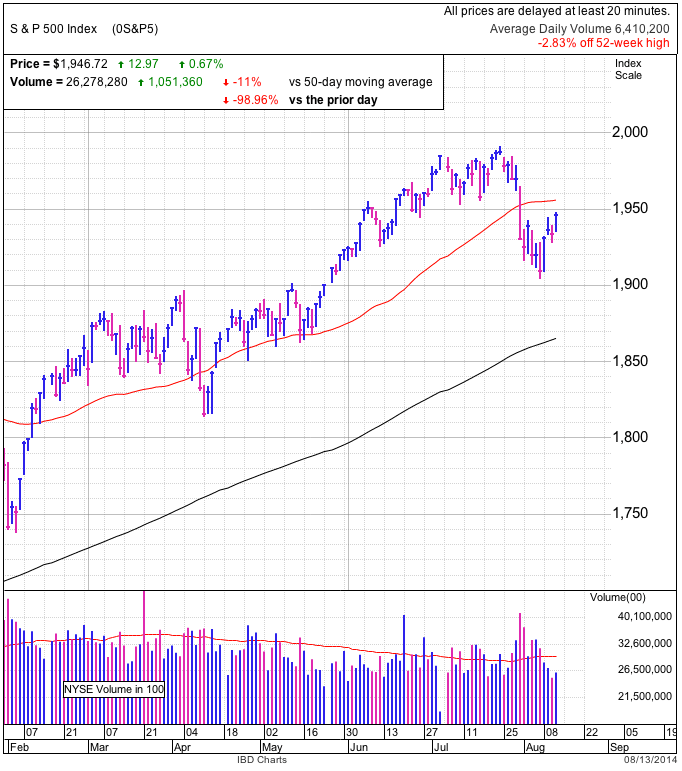 While today was technically a breakout, the lack of follow-on buying was uninspiring. Of course the more widely followed and significant level is 1,950. That has history going back to early June and will likely generate far more trading activity than a minor break of 1,940. Tuesday evening I said Wednesday would be a big day because either we breakout to the upside, or slip back into the consolidation. And wouldn’t you know it, the market made a liar out of me by doing neither and instead creeped higher, but fell shy of a 1,950 breakout. Being so close to a major technical level is too tempting for market makers and bots to not push us through, triggering all the automatic breakout buying and short-covering that would follow. But what happens after that is what we are most interested in. Do we find support and continue higher, or is this the last gasp of the rebound before retreating back into the consolidation? At this point the market could go either way. We are nearly exactly in the middle of the 1,910/1.990 trading range that began in mid-May. At the halfway point it is hard to claim we are overbought or oversold. Without an edge one way or the other, the best trade is to wait for a better trade. If forced to choose, at this point I would stick with the up-trend simply because that is where the momentum is. Holding above 1,950 and ignoring fearful headlines is bullish. Stalling and retreating back into the trading range is not necessarily bearish, but at best it means the rally needs more time before continuing. Looking ahead, most likely the real trading opportunities will come after Labor Day and everything before then is just noise. And on the third day the market rested, giving up a fraction of a percent following a two-day, 30-point rebound. Volume continues falling off a cliff as every day over the last five finished with less volume than the day before. Some claim low volume is bearish, others say it is bullish. But what we know for sure is traders are growing comfortable with their positions and simply waiting for the market to make its next move. Wednesday is an important day. Either we breakout and reclaim 1,950 support, or the rebound stalls and we fall back into the consolidation. Obviously a breakout is bullish, but slipping back into the trading range is not necessarily bearish. 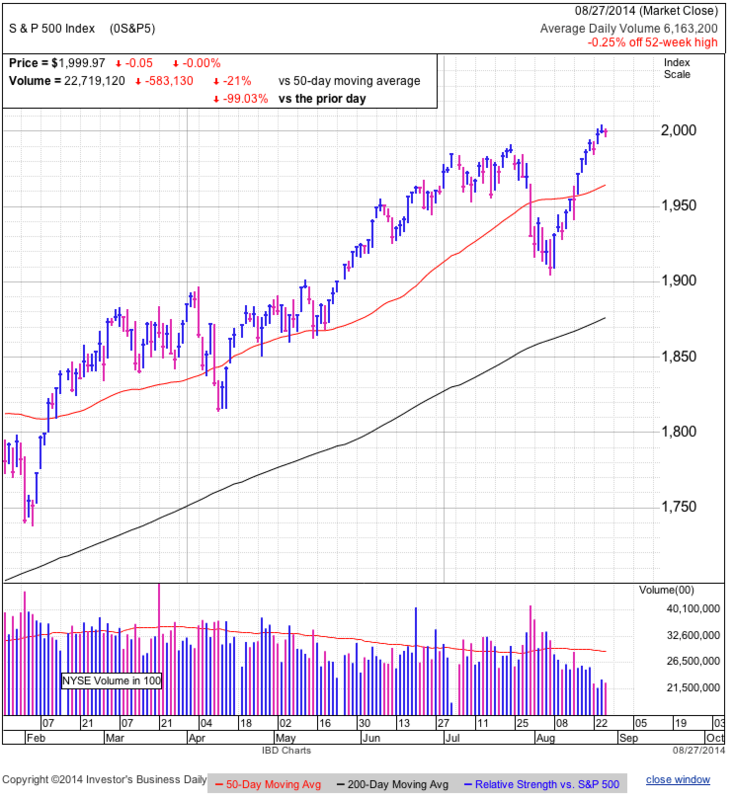 It could mean the market needs more time before resuming the up-trend. But the risk is the longer we stay inside the trading range, the more vulnerable we are to slipping under 1,900 support and triggering all the technical stop-losses littered under this widely followed level. That could kick off another round of emotion selling. But rather than fear this, we should embrace it because it will likely form a capitulation bottom and set the stage for a sharp, and profitable, rebound. The one warning I have bulls is rebounds from oversold conditions snap-back with ferocious force. 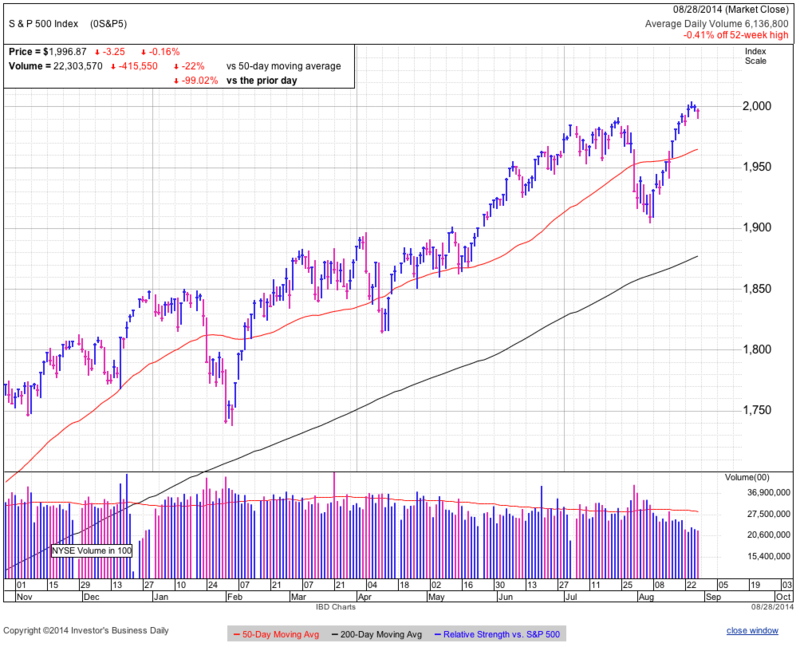 Trading between 1,910 and 1,940 for nearly two weeks shows the market is clearly not stretched to unsustainable levels. Either that means we have more selling left before finally reaching extreme levels, or the market is content hanging out here and we should expect a more protracted consolidation. Most of the time markets trade to extremes, meaning there is a good chance we will slip even further before this pullback is done. Often corrections find support halfway through the move as dip-buyers rush in and prop up the market. But if we cannot find a more diverse pool of interested buyers, demand dries up and we stumble into another leg lower. Failing to escape from this consolidation in coming days leaves us at greater risk of one last leg lower. It’s been a fearful couple weeks and we’ve seen quite a bit of turnover as ominous headlines scared out the weak and replaced them with confident traders willing to buy the dip. Retaking and holding 1,950 support will show the worst is behind us, at least in the near-term. At this point the market could go either way and we don’t have an edge in coin-flip style trades. Bulls can stay long, bears can stay short, and those out can stay out. But soon I expect we will get more clarity from the market as it reveals what it is thinking. From there we can find a trade with better odds. There was a little something for everyone today. For bulls, this was another relief rally, adding 0.3% to Friday’s bounce. For bears, we finished near the lows of the day as a lack of follow-on buying failed to fuel further gains. While we finished near the upper end of the recent 1,910/1,940 consolidation, an early attempt to break 1,950 was rebuffed. 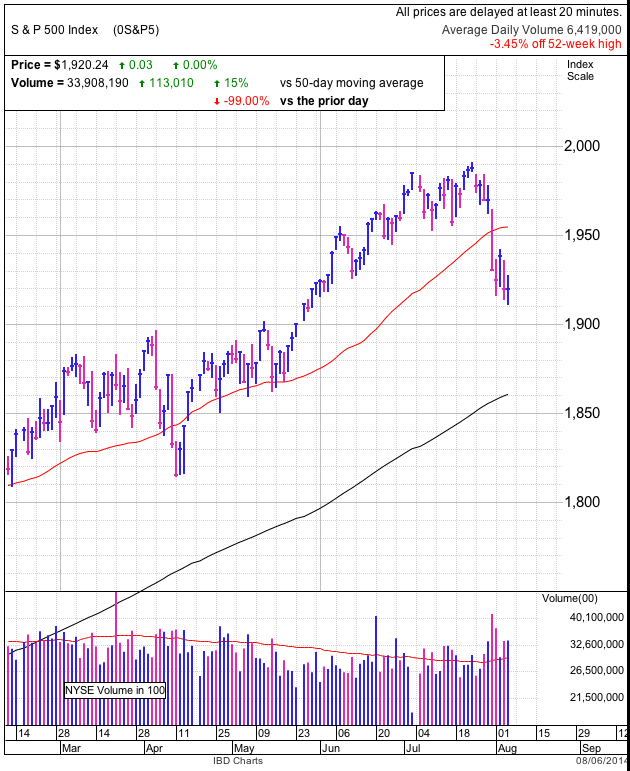 Ultimately few were motivated to trade today’s rebound and volume came in at the lowest level in several weeks. The question on everyone’s mind, is the worst behind us, or is this just a bull trap before continuing lower? If we use history as a guide, the last couple of times the market broke down, it temporarily found support before plunging one last time. See the accompanying chart. 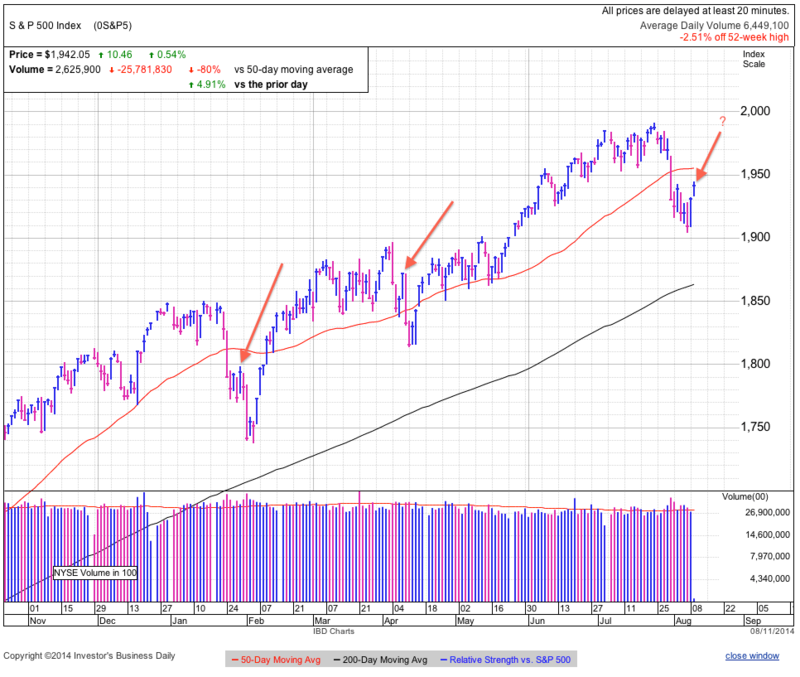 January 30th we traded to the upper end of a consolidation, but stumbled into a 60-point sell off two-days later. Same thing happened to April 9th’s rebound, two-days later we were down 55-points. The bullish takeaway from both plunges is they formed powerful capitulation bottoms that were excellent buying opportunities. While some fear is dissipating as Western forces gain the upper hand in Iraq and Ukraine, markets remain on edge. Another bad headline could send traders running for cover yet again. But rather than fear the volatility, we should embrace it because one man’s panic is another man’s gain. If buyers cannot push the market above 1,950, then we need to be wary of one last selloff. If buyers shrug off further fearful headlines and continue bidding up prices, holding above 1,950 and the 50dma will signal the worst is already behind us. As long as we remain inside the 1,910/1,940 consolidation, we are in no-man’s land and the market could break either way. I would be reluctant to buy until the market proves the worst is behind us by reclaiming the 50dma. If the market stumbles in coming days, that creates an interesting, but very brief shorting opportunity. Even with the wind at their back, bulls could not get it done and early strength faded into yet another down-day. It doesn’t matter what the financial press attributes this weakness to because we know the truth, no one wants to buy this market. Every day the market is flooded with hundreds of pieces of news and data. Some of it is bearish, some of it is bullish, and most of it is irrelevant. But in the short-term, none of it matters because most traders simply look for an excuse to justify their preconceived bias. If they are bullish, they will find plenty of reasons to buy. A bear will find countless number of reasons to dump his stock. Allegedly the market sold off on a slight variation of Russian and European news that’s been making the rounds for months. Who cares why the market sold off, the only thing that matters is what people are thinking and how they are positioned. We are still in a long-term secular bull market and this is just another buyable dip on our way to record highs, but we need to exercise restraint in the near-term. The inability to escape the lower reaches of this trading range proves we are not yet oversold. We all know the market always overdose it, so we need to wait until it reaches those extreme oversold levels before calling a bottom. While some use complicated mathematical formulas to calculate overbought and oversold levels, the only thing that matters is what the market thinks. We’ll know when we’ve gone too far because, it will snap back with decisive speed and ferocity. Groping for a bottom for five days is anything but ferocious. Watch out for another leg down. This slow motion crash isn’t enough to shake free those hanging on by their fingertips. We need something more spectacular to send the last of the holdouts scurrying for cover. Breaking under 1,900 support will trigger an avalanche of technical stop-loss orders and the swiftness of that automatic selling will convince others to join in the dash for the exits. But rather than cascade into the collapse everyone fears, this will be the dying gasp of this correction before we capitulate and bounce higher. The longer we hold near the lows, the more likely it is we will crash through support, but there is a chance this slow motion selloff is convincing enough fearful owners to sell to more confident dip-buyers. If we churn over an extended period of time, we might not have enough fearful owners left to trigger another emotional selloff. This is a much more ambiguous bottom and it is impossible to pick a nearby point where it would be clear I was wrong. I wouldn’t trust this sideways consolidation unless it stretches on for a few more weeks or finally holds above 1,950. The longer we hold near the lows, the more likely it is we’ll see another leg lower. Shorts can hold on for another leg lower and dip-buyers need to keep their powder dry until we have that capitulation bottom. Longer-term investors can ride this out, but they should wait a few days before adding to their favorite positions. A long way to nowhere as the market opened lower, then broke into the green, before ultimately finishing flat. While we held 1,920 support, the market had a hard time finding dip-buyers willing to chase prices higher. Most often capitulation bottoms are violent whipsaws with decisive rebounds. Treading water at this level is anything but decisive and shows we haven’t reached such extreme oversold levels that the market couldn’t help but snap back. While we could be forming a rounded base, there is far too much emotion in the market for such a boring move. Every day we fail to escape this gravity is one more day where late-to-the-party dip-buyers work up the nerve to buy support. But the more of these guys that get in, the greater the risk of crashing through support as we undercut all the automatic stop-losses forming under our feet. This is nothing more than another buyable dip in a secular bull market, but given the market’s inability to bounce shows we have not reached extreme oversold levels yet. This means we likely have another whoosh lower when the market undercuts all the stop-losses accumulating under support. The huge spike in volume over the last several days shows many of the willing sellers have already sold, meaning there is a far smaller pool of prospective sellers remaining. Markets bottom when everyone is convinced the selloff will continue and this selloff has everyone nervous. We will reach a point where there is no one left to sell and the market rebounds on tight supply. Every day of sideways churn brings us one day closer to that day where we run out of sellers. The longer the market holds in this trading range, the more likely it is we will break through support. While we are close to a bottom, the market is not acting like it is oversold yet. Bears can hold their shorts and dip-buyers should step back and wait for another whoosh. Stocks gave back all of Monday’s gains on above average volume and ever so slightly undercut Friday’s lows in intraday trade. Confidence was shattered when someone in the Polish government claimed Russia was preparing to invade Ukraine. While most doubted the accuracy of this claim, it was enough to send an already weak market into a 15-point tailspin midday. While we can ignore these alarmist comments, it is noteworthy how strongly the market reacted to even a hint, no matter how dubious, of an escalation in Ukraine. 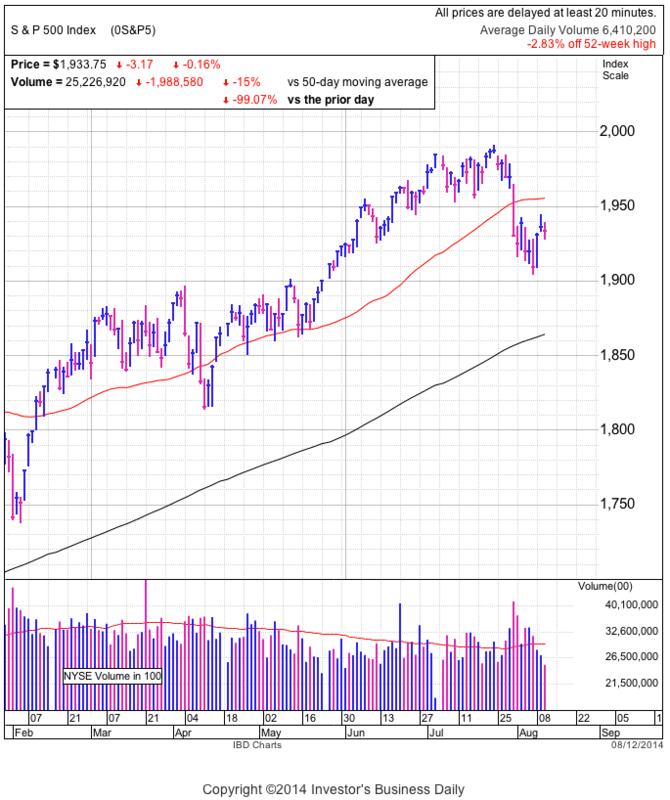 Market participants are skittish following the dramatic selloff last week and any whiff of problems sends them running for cover. The market is a modest 3.5% from record highs, but you wouldn’t know it given all the pundits claiming the sky is falling. Sentiment is plummeting, put/call ratios are spiking, and anyone watching the financial media is scared to death. Given how dramatic the reversal in sentiment, it seems likely this is an overreaction to recycled headlines that have been in the news for months. Simple fact is markets move up and down. If everyone knew a dip wasn’t the start of something bigger, no one would sell it, everyone would buy it, and we’d all be rich. But we know the market doesn’t work that way. Dips are dips because they scare the hell out of owners and everyone assumes prices will continue dramatically lower. If they didn’t, no one would impulsively sell their stocks at a discount and we wouldn’t get a dip in the first place. Most everyone agrees the economy is still improving and the fundamental data backs it up. The criticism bears have is this market’s gone too far and is overvalued. They have long claimed we are on the verge of a correction and they are confident this time is the real deal. And so far they’ve been persuasive enough to convince a lot of other people to dump their stocks too. Every dip in the history of the market was a buying opportunity and this one will be no different. The only question is how far this will go before it is buyable. Given how quickly sentiment shifted and how little meat there is to the fundamental justifications for this weakness, the bottom is likely quite near. While we might have one last leg lower, that would be the last flush before we bottom. If Putin actually invades Ukraine, the threat of WWIII will crush the markets. The best trading opportunities arise from having the courage to buy when everyone else is scared. While the market is poised for another dramatic down day if we fail to hold 1,920, we should be looking for bargains to be bought rather than dumping stocks at a discount. Everyone knows markets go up and down, but they always forget it in the moment.